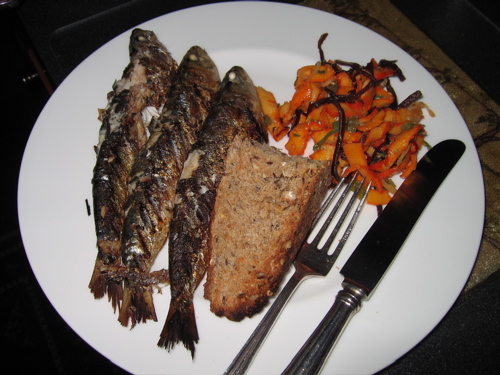 Not what you think, but the real, fresh sardines from Portugal…. easy to cook, maybe not so elegant to eat…. olive oil, lemon juice, sea salt, (lots) fresh cracked pepper and a smoking hot griddle. Mine is a ridged grill plate of cast iron bought by my parents at E. Dehillerin during the late ’70’s. The trick is to get the grill very hot with the griddle inside. Make sure that your grill/griddle is free of any stuck on bits by giving it a thorough brushing. Oil the griddle or grill rack. When the griddle is literally smoking hot, slap the fish onto it and cook for roughly 2-3 minutes a side. they will release from the cook surface when they are ready to turn. Squeeze a little more fresh lemon juice over the fish and serve piping hot. Traditionally one would eat these as you would an ear of corn, sort of. Start at the top and scrap the meat from the bones eating top to bottom of the fish. I used a fork. But, I use a fork to peel and eat shrimp… . This is also an opportunity to use your bone plates. Serve with a good, cold Sauvignon Blanc, a salad, some crusty bread and a marinated octopus salad as I did. This entry was posted in Entertaining and tagged bone plates, sardines, seafood recipes, summer grilling, table settings. Bookmark the permalink. I love Dehillerin! It was the first place I ever went by myself in Paris! I’ve gone back since and have purchased some copper pots & pans. My father would love this dish! Each time I neglect coming by, then I see your latest post, only to find what I love. My favorite restaurant in London, La Famiglia, does these(rumor is it was mob owned at one time). I have never been able to replicate or even come close. Thanks for the education. I’ll try again. It’s those damned little bones that keep from enjoying this fully. Oish-so! (Japanese for “looks delicious!”). As for those pesky bones, I, too use a fork (or chopsticks) but my mother and her family who are from Tokyo, have the special gene that somehow allows them to eat fish elegantly without fussing with the bones. Perhaps if you are born and raised to eat fish this way (the only de-boned fish eaten in Japan is sashimi for sushi), you learn an elegant way to do it well. I, however, being raised in the US, still fuss with the bones.